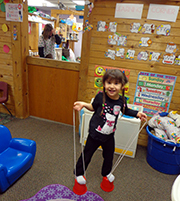 Child care center │ New London, WI │ after school care │ Robin’s Nest Learning Center, LLC. At Robin’s Nest Learning Center, LLC, we go above and beyond to create a family-like atmosphere, including making childcare convenient for working parents. We strive to accommodate families of all schedules by offering part-time care, whether it's crossover time due to a shift change, or even just a few days a week. We prioritize flexibility in our scheduling each week, and are licensed to open at 3:15 am in order to help parents who work first shift and require child care before 6:00 am. We also offer Saturday care as needed.